Security officials gather at the site of a bomb explosion in Quetta, Pakistan, Aug. 11, 2016. Pakistan is calling on Afghanistan to help create a formal intelligence-sharing deal so that the countries can better address allegations that their spy agencies are involved with anti-state violence on both sides of their shared border. Pakistani prime minister’s foreign policy advisor, Sartaj Aziz, renewed the call amid allegations the Afghan intelligence agency, National Directorate of Security (NDS) had links to Monday’s deadly suicide hospital bombing in the southwestern city of Quetta. The attack killed more than 70 people and wounded scores of others, with most of the victims belonging to the lawyer community. 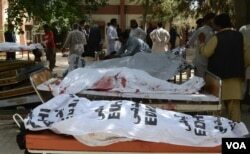 A splinter faction of the Pakistani Taliban, known as Jamaat-ul-Ahrar, or JuA, claimed responsibility for the bloodshed. The United States last month designated it as a global terrorist organization. “It has already been known that this group (JuA) is somewhat indirectly being supported by the NDS,” Aziz asserted, while addressing a news conference in Islamabad. He added the militants operate out of Afghanistan. Aziz went on to defend official assertions that rival India’s intelligence agency might also have exploited its collaboration with Afghan counterparts to plot the attack and previous terrorist raids in Pakistan. “We do not want to indulge in finger pointing at this stage without gathering complete evidence as to who was involved in this attack. But we fear and are concerned that this possibility exists and as the investigation progresses it would become evident,” Aziz said. 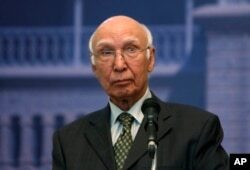 FILE - Pakistani foreign policy chief Sartaj Aziz. The advisor noted that in official discussions with their Afghan counterparts, Pakistani interlocutors are trying to promote close “links and interaction” between the Pakistani spy agency, Inter-Services Intelligence, or ISI, and NDS to enable the two countries identify incidents of their involvement and to prevent terrorists from using their respective soils against each other. “This commitment can only be monitored when interaction exists between the two intelligence agencies at various levels, including at the border level and higher level. This is our objective and God willing we will make progress towards it,” vowed Aziz. It may not completely deter terrorism, he said, but asserted cooperation between ISI and NDS in terms of timely sharing of intelligence about possible terrorist or other illegal movements across the border will help minimize mutual "misperceptions and misunderstandings." The Afghan government condemned the Quetta suicide bombing as a terrorist attack and has strongly rejected charges that its intelligence agency was involved. For its part, Kabul has long accused the Pakistani ISI of covertly providing sanctuaries to the Afghan Taliban and the Haqqani Network of terrorists for staging attacks against local and foreign forces in Afghanistan. Islamabad acknowledges Taliban insurgents are among millions of Afghan refugees Pakistan has been hosting for more than three decades but denies giving any support to the Afghan insurgency. Aziz acknowledged that there is mistrust in bilateral relations because of “historical reasons” but said that if established, the proposed intelligence cooperation forum will be to the benefit of both Pakistan and Afghanistan.